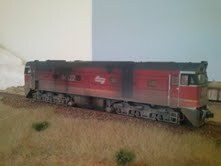 The Musings of a NSW modeler...: Customer Satisfaction! Another Job complete for a customer. Another Jumbo ready to be added to the roster. 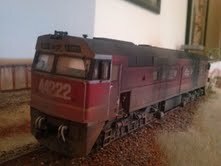 This Austrains 442 started out as Silverton 442s6, so was given the full treatment. Strip/prime/repaint/decal/number as well as super detailed with brass fletner vent, air hoses, brake air lines, sander piping, horn sets, hand rails, wipers and mirrors also white metal brake cylinders and cast staff exchangers. And to top it off a hand made interior for both ends including brass seats and control stands and a couple of Trainorama crew. 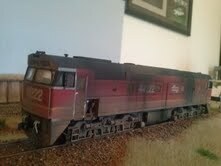 Then was weathered up with brush, air brush and powders. End result? See below! As always comments and questions welcome! Yep...definately an ALCO. Nice job Kyle, as usual ! Was talking to a mate the other day who bought one of your 79's, he's very happy with it. G'day Gary. 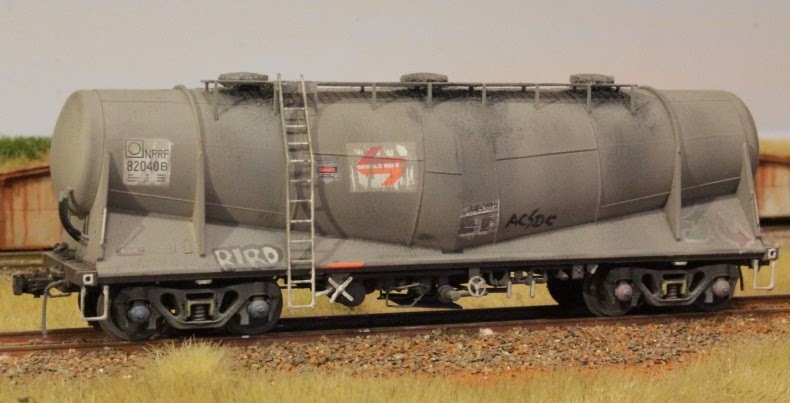 Thanks for the kind words.And no Alco is really an Alco without looking like someone spilled 1000 liters of a of mixture of used oil and matt black over the roof! Ha ha. And i'm glad your mate liked the 79, I've had a couple of requests for some commission work to be done on some 79's from others too! That'll keep me busy for a while! Great job on the Jumbo...very well done!